Does the council stop good behaviour? I’ve followed, from a distance, the Society of Local Authority Chief Executives (SOLACE) conference today. Far from having sessions on fat cat salaries this morning seems to have been devoted to dismissing Nudge to move onto a new fad involving social connections. Nudge was on one of those fads taken up a few years ago on, effectively, changing people’s behaviour with intelligent design. Classic examples include painting a fly on a urinal (which reduced the cleaning needed because men’s aim improved) or creating the illusion of uneven road surfaces (which reduce traffic speed). There are plenty of examples on their blog. The fundamental principle was ‘choice architecture’ – designing the choices people make so it’s easier for them to make the right choice. Push the button: For some reason everyone approached this as a pump, and assumed it was broken when it didn't work that way. A few weeks ago we took MiniMe to the Science Museum (mainly because I wanted to see the Apollo 10 command module) where there’s a small area for younger children in the basement. 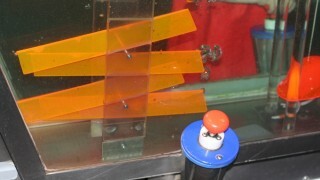 A large part is water play, and one bit has air jets under various obstacles so you can see how air moves through water. The problem is that every single person who tried to activate them attempted to pump the button, very few actually experimented to discover they were buttons and you had to keep them depressed to make them work. A silly example, perhaps, but an interesting one. The area, designed for 3-6 year olds, although I’m sure MiniMe wasn’t the only one under that limit (he’s not quite two), yet everyone, young and old, repeated that mistake. There was clearly something about the design that encouraged people to pump, but not to push. And the consequence was that no-one used that bit of equipment. The idea that the concepts behind Nudge should be forgotten, as if it was a pair of 70s flares and a horrible mistake, is a nonsense – if the principles were valid a few years ago they remain valid now. I’m not sure why the change in belief, there is always the pressure to appear modern, but perhaps there is also the difficulty in truly adopting something like Nudge in government. For a start are political difficulties. For example, I have long liked the idea of rewards for people getting back into, and holding down, work. The argument against is that work is its own reward and people should not need added incentive. However, the reality is that for many the idea of sacrificing 35 hours or more a week of ‘free’ time for a small increase in income is not that enticing. But adding an incentive (which need not be that much, vouchers for McDonald’s or stores) reinforces the positive aspects of working by directly linking work with positive outcomes. I would argue it far outweighs the long, and even short, term costs of unemployment. There are also administrative and cost difficulties. If you take Wandsworth’s street parties, they were incredibly expensive – largely a result of the work that was necessary on the council’s part (since deemed unnecessary by the government). Moving to a cheap fixed fee helps encourage the behaviour we want, the sense of neighbourhood and belonging, but left us with the same work to be done and the added complication of co-ordinating across a number of events, rather than just one. However, in tough times it might seem hard to justify added costs to the council against intangible benefits to the community. And finally there are the cultural difficulties. As I touched on yesterday it seems that we live in a culture that is defined by the negative– what you can’t do – rather than the positive – what you can do. It is so much easier and much more comfortable to think and act as enforcers in a black and white world than as the encouragers with ever lighter shades of grey. Which all set me wondering about Wandsworth. The council is, in the neutral sense of the word, a huge bureaucracy – an effect of thirteen years of government target culture and the Daily Mail mentality that creates a risk-adverse approach to public money. Has this led to us developing barriers that discourage people from acting positively? Do you have any examples? I’d love to hear them. Such as ‘Not having litter bins at stations legitimises littering’? This page of the council website makes it clear to me why people dump rubbish on the street. Now does the previous owner’s dismantled desk that they left in our cellar count as 1 piece of furniture, or should i saw it up into 3 standard sized sacks? and if i did would they still weigh less than 25kg and How would I even Know? what about the spare kitchen cabinet panels, scraps of carpet or broken pane of glass? It makes my head hurt. Wouldn’t 1 fee be easier? or small / medium / large collection fee? or 1-yearly free collection? Also when people try to do the right thing and then can’t find the information they’re looking for on the council website because it’s rubbish, I’d say that stops good behaviour. 3rd thing then I’ll stop – could small electrical items be collected in the recycling waste? perhaps the bags are sorted elsewhere from where WEEE directive items are disposed of, but whilst I’m sure large items like tellys are taken to the tip by responsible owners, or collected via the above evil scheme, I have a drawerful of small broken electrical items – duck radio, freeview player, phone, electric whisk – that Should make for a fun trip on the bus to the tip but which I’m just itching to ‘accidently’ drop in the bin as I’m sure many others do. Some sort of collection or collection point (as with batteries, which I’d Never put in the bin now) would make it a lot easier for keen-recyclers to stick to their morals. Probably not what you meant but a good whinge has made me feel better. I’ve finally got around to responding to this with a new post. I’ll be honest, I’m not sure I’ve entirely responded to it!